This left facing, ¾ profile portrait shows William Paterson in the uniform of a Lieutenant Colonel in the New South Wales Corps. At this time all British infantry wore red woollen jackets, and the practice of distinguishing regiments by different coloured facings had been in general use since the early 18th century. Officers’ jackets, as shown in this ½ length portrait, were made of a bright scarlet cloth, well-tailored and close fitting, often padded to exaggerate the outline. The jacket of the New South Wales Corps uniform was brass-buttoned and double-breasted, with button-back lapels, dark mustard yellow facings and stand collar, the tasselled silver epaulettes at the shoulder denoting rank, worn with a white cross belt with the regimental insignia on the cross-plate, over a white linen shirt and black neckcloth. 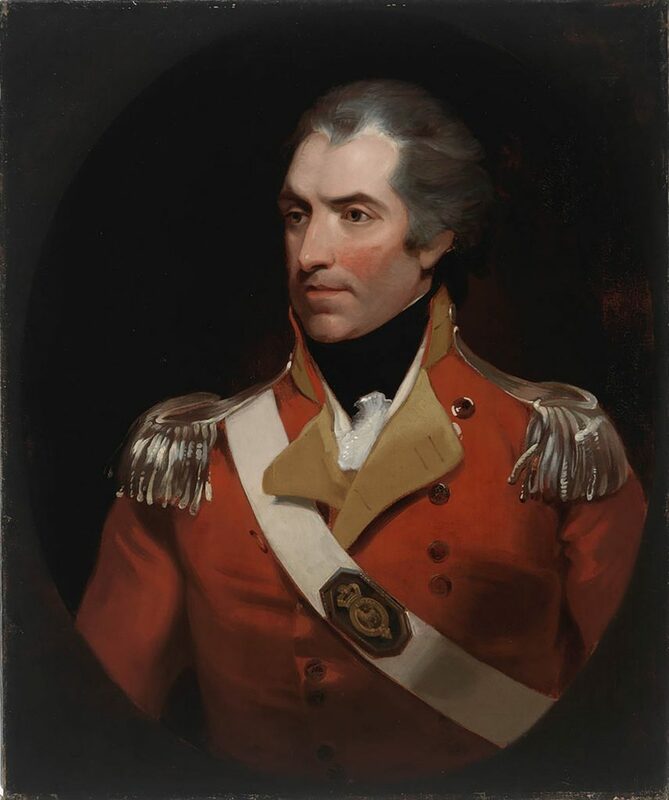 Captain William Paterson (1755-1810) arrived in Sydney with his wife Elizabeth (1770-1839) in October 1791. From 1793, the couple lived in England for three years, where Paterson was promoted to Lieutenant Colonel in 1789. Just prior to their return to New South Wales in 1799, the Patersons sat of their portraits by William Owen (1769-1825), one of Britain’s most eminent painters and known for his portraits of society figures. On 1 January 1809, after the deposition of Governor William Bligh in the ‘Rum Rebellion’ (26 January 1809), the New South Wales Corps selected Paterson to act as interim Governor of New South until the arrival of Governor Lachlan Macquarie in late 1809. Paterson left Sydney for England on 12 May 1810, but died at sea a few weeks later on board HMS Dromedary off Cape Horn.